Trick or Treat? Oops, Here's Wishing You a Very Happy Diwali! Diwali was a fun thing. It was about oil-lit diyas. It was about eating sweets both homemade and ones got from the local sweetshop. Lots of it. It was about visiting neighbours. And along with them visiting other neighbours and wishing everyone a very Happy Diwali. It was also about the annual clean up. And of course it was about bursting crackers. Rockets. Bombs. Sparklers and the works. Twenty-five years back, there was no guilt about polluting the environment. Neither was there a guilt about bursting too many crackers because there was nothing like bursting too many crackers. You burst crackers in the morning. You burst crackers in the afternoon, when everyone was trying to take their nice Diwali afternoon nap. And you burst crackers in the night. Things have changed since then. People have run out of time. Diwali now is about keeping up with the Joneses. It is about readymade wax-lit diyas and artificially made rangolis. It is about cheap Chinese lighting and lamps, which are lit up almost ten days in advance. Of course, like most cheap things Made in China, they are use and throw. Like my mother was asking my father a couple of days back: "jaane is saal chalenge bhi kyai? (wonder if they will work this year or not). It is about praying in front of small statues of Lakshmi and Ganesha, which are Made in China, along with the crackers, the lighting and everything else you can possibly think of. We aren't competitive even on this. It is about sending cheesy Diwali forwards on WhatsApp on phones assembled or Made in China. It is about gifting chocolates and not sweets. And not just ones Made in India. French ones seem to be the flavor of the season in Delhi, where I am right now. Sweetshops, before Diwali, now display chocolate boxes more prominently than they display sweets. Clearly, you know, where the margins are higher. But it still makes me wonder, why is the quality of the chocolate being sold so poor? It is about newspapers running into more than 100 pages, advertising sales all over the place. Everyone from Amazon to Flipkart to Big Bazar to local shops, has a sale going right now. It is as if people were waiting all through the year to buy everything that they need, in a week up to Diwali. Capitalism has taken over and is in its worst form. It is now about buying things on a discount using a credit card, getting a small cashback in the process, and then slogging through the rest of the year to pay up. So what else is Diwali about? Well, it is about wearing clothes that are straight out of a Karan Johar movie. I have shortlisted a pink kurta with a navy blue jacket along with corduroy trousers, to wear this year. Somehow I have not been able to convince myself about this pyjama wearing business. Pyjamas remind me of a time, when they were worn when one slept at night or as a relaxed wear on Sunday or some such holiday, when you didn't want to spoil your more expensive clothes. I have worn way too many white, cream, light green and light blue pyjamas, while sleeping over the years. I started wearing shorts only in my 30s, once finding good pyjamas became a tad difficult, in the city I live in. Oh and the one thing Diwali shouldn't be about, it is still is - crackers. Over the last one decade, I have spent almost all Diwalis in Delhi. Ten years back, the bursting of crackers started a few days before Diwali. Over the years, this doesn't seem to happen as much as was the case in the past. And every year, this leads people to think, maybe on Diwali day Delhites will stay away from bursting crackers and not add to the pollution, which is anyway very high, due to all the rice straw being burnt in Punjab and Haryana. But Delhites being Delhites do what they do every year. By 8PM on Diwali day, after the poojas are done, the bursting of crackers starts, by 10PM it is in full swing and by midnight smoke has usually filled up the rooms and I am sneezing at top speed given that I am allergic to smoke. On this day, the black money that the city thrives on, can be seen going up in smoke. All this happens, despite the restrictions imposed by the Supreme Court. The supply-chain is so efficient that the crackers find their way all around the city. In the days after Diwali, the city turns into dystopian gas chamber (not that it is all clear right now) where you can see people moving around in masks, across the metro, which is the main form of transport in the city. First they burn the crackers, then they get their masks out. Of course, the masks can't do anything about the eyes, which tend to turn blood-red with all the smoke going around in the atmosphere. How can you blame them for anything? Typically, I used to stay in Delhi for at least a week to ten days after Diwali and take in all the smoke and the pollution. This time, and I happy to say this, I am flying out, a day after Diwali and landing in Mumbai, where the pollution is half that of Delhi (Some chart on Twitter showed that, the other day). While growing up in Ranchi, the one festival I hated the most was Holi. It brought out the worst in the men who celebrated it in different ways, right from using used battery carbon as a colour to be applied on the faces of people you are celebrating holy with to misbehaving with women. Diwali in Delhi reminds me of that. It's just that instead of misbehaving with women, like was the case with Holi, the city misbehaves with itself by bursting as many crackers as it does every year. While, the bursting of crackers in the city, may have come down over the years, thanks to people getting environmentally more conscious, children in particular, the city continues to burst way too many crackers than it should. If this was a TV commercial, which recommended the celebration of an environmentally friendly Diwali this year, the next thing it would be saying is, let's take a vow not to burst crackers this year and celebrate an environmentally friendly Diwali. But then I know my Dilliwallahs a little better than that. Diwali, in a way, has now become a festival of adults. Once crackers go out of the equation, the kids have very little to do in it now. And not surprisingly, in many societies and gated communities, in India's cities, kids have more fun celebrating Halloween these days than Diwali. So what will it be, Trick or Treat? Oops. Here is wishing you a very Happy Diwali. We request your view! Post a comment on "Trick or Treat? 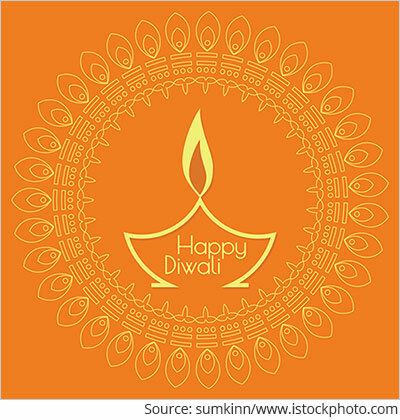 Oops, Here's Wishing You a Very Happy Diwali!". Thank you for posting your view! 2 Responses to "Trick or Treat? Oops, Here's Wishing You a Very Happy Diwali!"